Shrinkage Bar Mould (Four Gang) for Cement Testing - The mould is used for casting specimens of cement & aggregate combinations for measuring the potential expansive alkali reactivity. Bar mould as above but in gun metal as well as with knurled and threaded reference pins are also available. Spares: Stainless steel smooth or knurled and threaded reference pins as required. 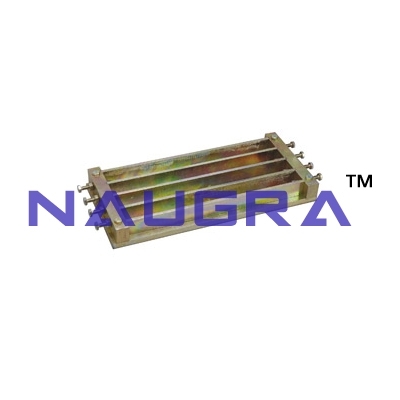 Supplied in Packs of one dozen..
We are leading manufacturers, suppliers & exporters of Shrinkage Bar Mould (Four Gang) For Testing Lab for Cement Testing Lab. Contact us to get high quality designed Shrinkage Bar Mould (Four Gang) For Testing Lab for Cement Testing Lab for schools, colleges, universities, research labs, laboratories and various industries. We accept bulk orders for government tenders in all countries around the globe.